We guide the White River year round. So if you have a date that works for you, we are fishing! 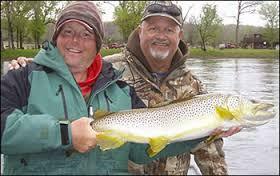 We catch crazy numbers of nice Rainbow Trout and good numbers of Brown Trout on most trips. We also catch Brooks and Cutthroat on occasion. Don't forget that not only do you get to enjoy catching a fish, you will also be taking in the BEAUTY of the Ozarks! So my question to you is....why wouldn't you come to the White River? Don't forget to look at our calender to see what kind of fishing and what time of the year works for you. 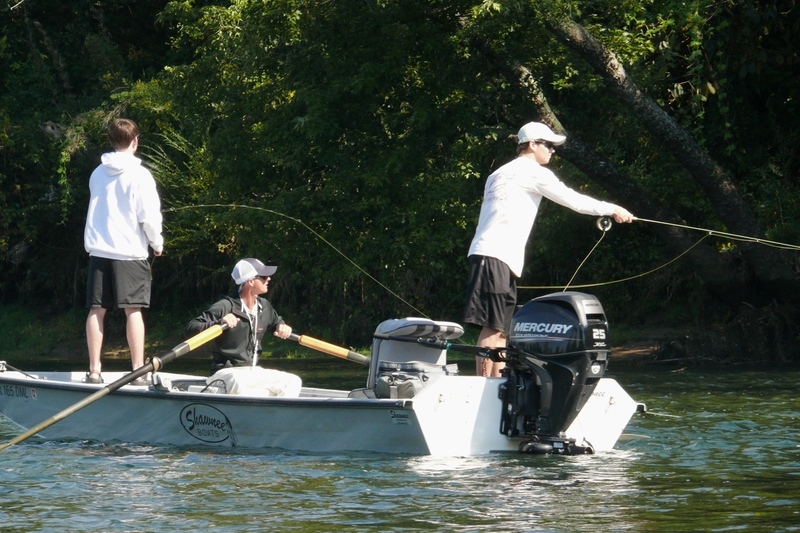 Chad Johnson and Larry McNair are two of the guides that work with Cranor's on a regular basis. Chad Johnson ~ Chad has honed his guiding skills through years of taking clients fishing across America from Lousianna to Alaska. 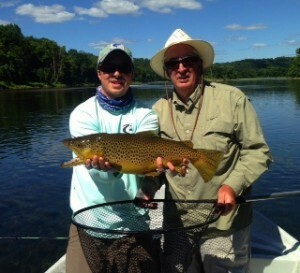 Chad is a true professional fly fisherman and knows how to catch big fish on a fly rod. 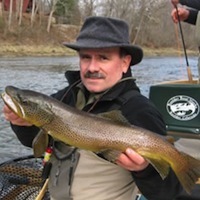 He can serve your needs weather you are a novice needing casting instruction or a seasoned veteran looking to catch one of the monster browns that the White River is famous for. Chad is a well-known fly tyer too! Larry McNair ~ Larry is an Ozarks native who was raised just miles away from the White river. He has spent a lifetime studying trout and learning how to catch them. When it comes to putting fish in the net no one has more experience and does it better than Larry McNair. Marc Poulos - Marc has been fishing these waters since the 1950's. A Navy veteran, Marc has lived and traveled all over the world. Over twenty years ago, he landed back in the Ozarks and fishing on the White River basin. He loves to help people experience the satisfaction of fishing! Ben Levin - Ben Levin is a native of Arkansas and has been fishing since he was a child, and guiding since he was a teenager! He has guided in Idaho, Montana, Wyoming, and Alaska, as well as his native Arkansas. A graduate of the University of Arkansas, Ben guides full time on the White and Norfork tailwaters, as well as for smallmouth bass across the Ozarks. Gabe Levin - Gabe grew up in the Ozarks his brother Ben, and together they spent every free moment chasing trout and smallmouth with a fly rod. Gabe has been guiding professionally since October 2013. Which season best fits your skill level and expectations? Winter (December-early March) is Streamer Season...when we fish for the Big Boys. We use 7-8 weight rods with sinking lines. During these months is when we cast big streamers to the banks. 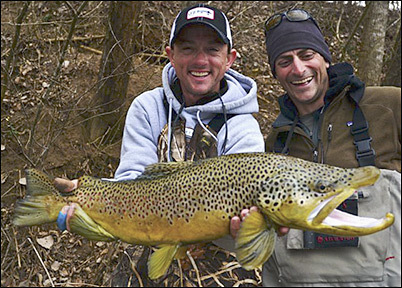 If you enjoy seeing Big Browns chase and eat what you are casting with a vengeance, this is the season for you. During these months is also the time for Trophy Trout, not high numbers of trout. Call us, we'd love to guide you to your Trophy Trout on a fly. 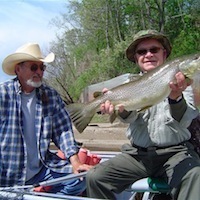 Spring (mid March - May) is Dry Fly Season or "Hatch" time in the Ozarks. We use 4-5 weight rods with floating lines. We have a prolific Caddis Hatch through mid-May, then a Sulfur Hatch till mid-June. When I say "Hatch" I mean bugs hatching in the cup holder of your boat! Every fish in the river is feeding on pupas in the early morning, emergers during the mid-morning and dries all afternoon. This results in great numbers of nice Rainbow and site-casting to some really nice Brown Trout. 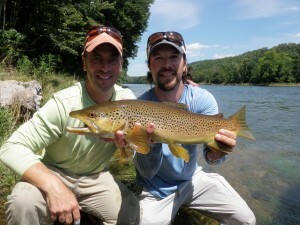 Dry fly Fisherman...this is when you will want to book! Summer ( June – August ) The “dog days of summer” may become the “hog days” of summer if the water is right to fish hoppers a long the grassy banks. A hopper dropper can be a great combination. If you like to watch big fish come up to big bugs this might be the time for you. Just keep your powder dry and don’t yank it out of his mouth! Fall (September-November) A beautiful time in the Ozarks! If you're are a leaf peeper don’t miss this. The fishing can be even better than the colors. Those hoppers can go all the way through September and the midge fishing is excellent. When the leaves start to turn it is time for the browns to spawn and although we don’t like to take those fish off the reds there are always a bunch of egg eaters around to keep your rod bent!